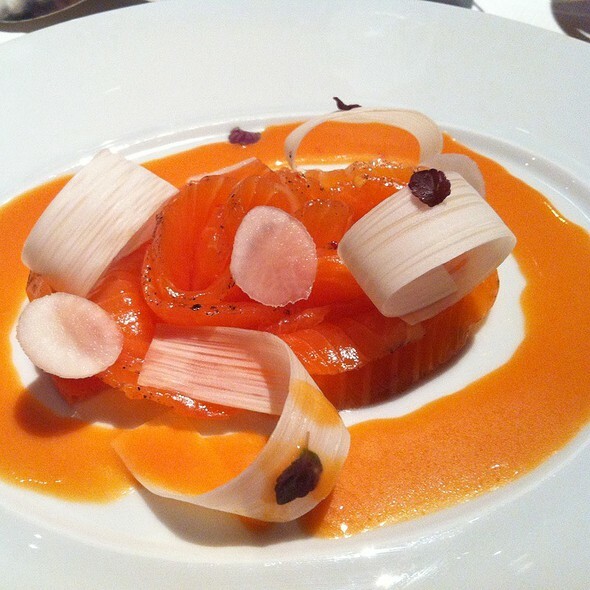 Le Bernardin, Zagat's top pick for 2013, and awarded the Michelin Guide's coveted 3-stars as well as The New York Times' highest rating of 4-stars, has maintained its status of excellence for over 20 years and its international acclaim as one of the world's top seafood restaurants. Owner/Chef Eric Ripert continues to set unsurpassed standards with his piscatorial paradise and partner Maguy Le Coze's seamless and unparalleled service. *When making your reservation, please indicate in the Special Requests box if you will be attending THEATER so that we may accommodate you appropriately. Le Bernardin welcomes young diners age 8 and over. Experience NY's highest rated restaurant in an exclusive private setting. The private room, Le Salon Bernardin, is surrounded by etched glass with floor to ceiling windows. Located on the second floor this exclusive room is equipped with it's own private entrance, kitchen, restrooms and coatcheck. There is a parking garage on 51st Street between 6th and 7th Avenues as well as on 51st Street between 7th Avenue and Broadway. My wife and I had lunch at Le Bernardin last week. We both had sole as the entree. Both entrees were chewy and overcooked. Rest of the meal was undistinguished. Will not return. Le Bernardin is always superb; excellent food and attention. Simply the best dining experience you could want. Professional service and inventive but delicious food. Bring a good charge card, but definitely worth every penny. 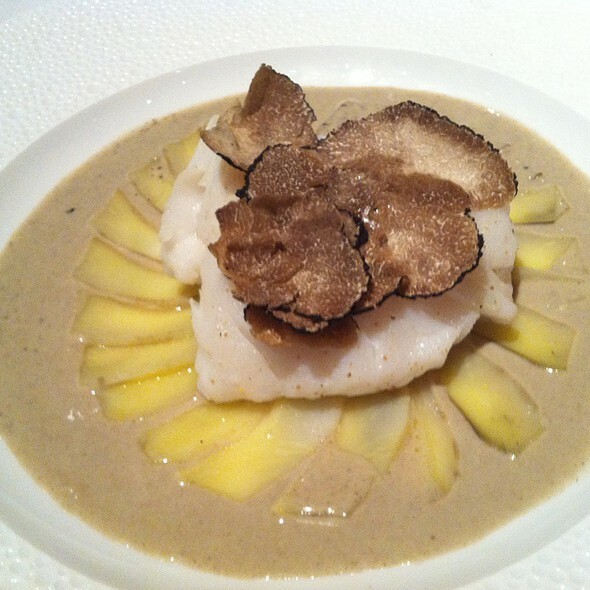 Le Bernardin is a wonderful and special dining experience. The atmosphere is tranquil and open. Wooden walls and ceilings are accented with large white flowers in tall vases and large mural size paintings of the ocean. The interior is not fussy or flashy. It's classic simplicity helps to accentuate what is most important here: the food. Eric Ripert has created a true dining experience. You do not rush in and out. You sit and explore a culinary vision. The tasting menus are worth the price and length of time to consume them. Do the Chef's menu. 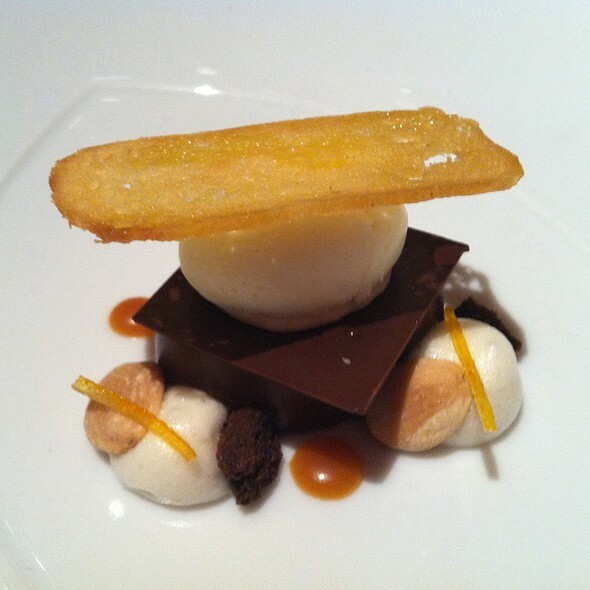 The Le Bernardin menu is great, but you will be given surprises with the Chef's. Take your time and listen to each explanation from the staff. They care about the service and food more than you know. The seafood focused food is exceptional. The service is beyond attentive. The drinks are unique and hand crafted. The wine menu is top-notch, and if you do the pairing with the tasting menus, you cannot go wrong. Now my second experience, I cannot stress how impressed I am with this establishment . I had my first dinner early in the day and most recent at an 11pm reservation after a Broadway show. Both times, I was given the same level of attentive professionalism that is often lacking in many restaurants. Take the time to get a reservation at Le Bernardin and spend a few hours - you won't regret it. Great 3-Michelin Star restaurant! Seafood-oriented, and amazing flavors. We went to the restaurant to celebrate our wedding anniversary. We were treated beautifully by everyone. The food was excellent as was the service and the al the people who attended us. I am especially grateful to Mr. Tomislav Dzelalija who made every effort possible so that we could celebrate such an important date for us in this wonderful place. Thank you a lot. One of the best dining experiences anywhere. Come here for seafood. The dishes were extremely creative and very delicious. Sommelier Aldo is one of the best I've encountered anywhere. 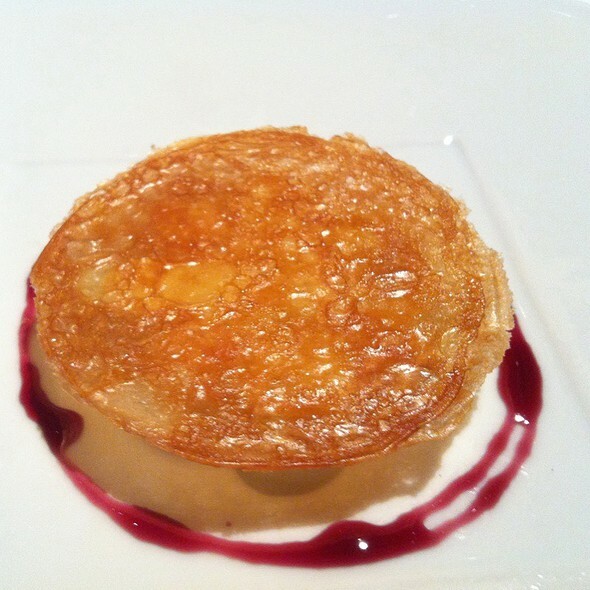 Although it is an expensive restaurant, I felt it well worth the money and a great place to celebrate special occasions. One of the premiere restaurants in NYC, right up there with the 4 star european chefs. Just stunning, from walking in the door, throughout the meal. Easily one of the best meals of my life. We had the chef's tasting and every course was outstanding. Lives up to its acclaim as one of the best restaurants in the world. I proposed to my girlfriend there! We each had the eight course tasting menu and wine pairing. It was truly exquisite. You will experience senses you didn't even know you had previously. The staff and service was professional and very courteous. 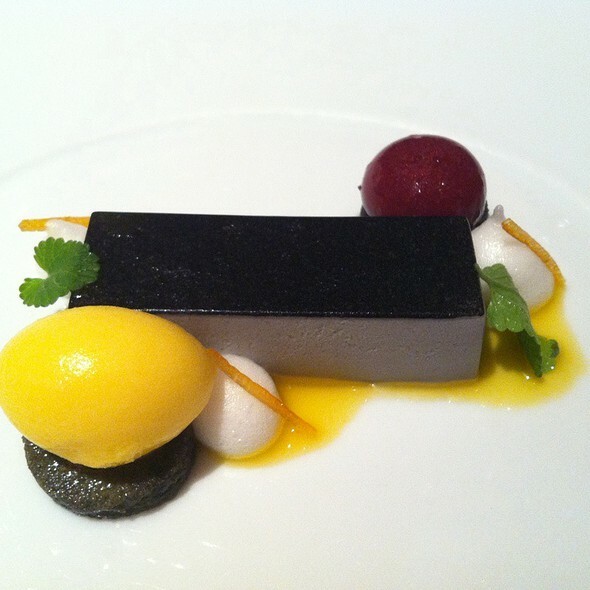 I highly recommend Le Bernardin. The food is outstanding no doubt about it but the warm service, have left a long and lasting impression to us. We love Le Bernardin's staff. My wife and I went to Le Bernardin for our anniversary. We are foodies and we discovered the reason why the restaurant has been on the top lists consistently for years and years: The food is outstanding. We can only rave about the place, its menu, quality of ingredients and preparation. Being overly critical and in light of the Michelin star level, we would not have expected to be handed a menu that had a stain on it. That's really the only tiny minus about an otherwise outstanding experience. 98 out of 100. Excellent as expected. I felt it become better than the last visiting in service. We will definitely come back again. 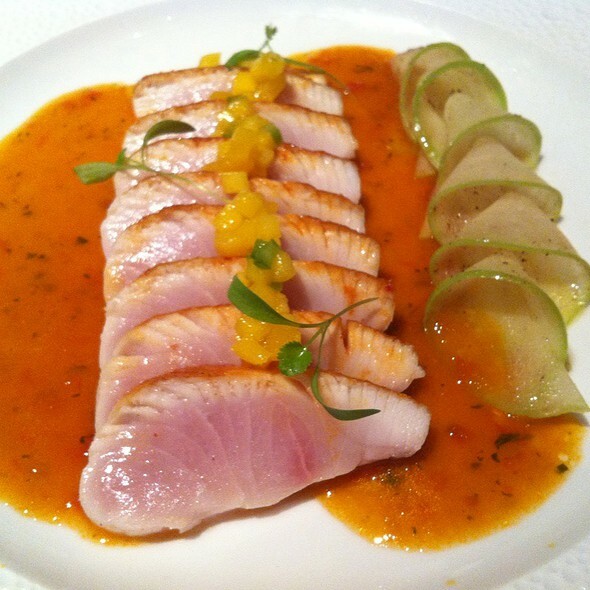 Le Bernardin lived up to its excellent reputation. Everything we ate was exquisite and impeccably cooked/prepared. The service was exceptional, although I called ahead to let the staff know I don't eat red meat, and I also told them when we arrived. I was served a chorizo sauce, but they quickly brought me a new dish when I reminded them, and also brought us bonus dessert! One of the best dining experiences I've had in New York. Good service and food is better than I had expected. Definitely a well deserved 3 Michelin star restaurant. My wife and I have been coming to Le Bernardin for better than 30 years on an occasional basis. One would expect the quality of the food and service to diminish over time, but that is not the case here. There is a wow factor to the finest New York City restaurant. It is nothing short of an amazing experience. Thank you! Maybe because it's a lunch and there are many price options available, the dining room and the lounge were both pretty much filled up. 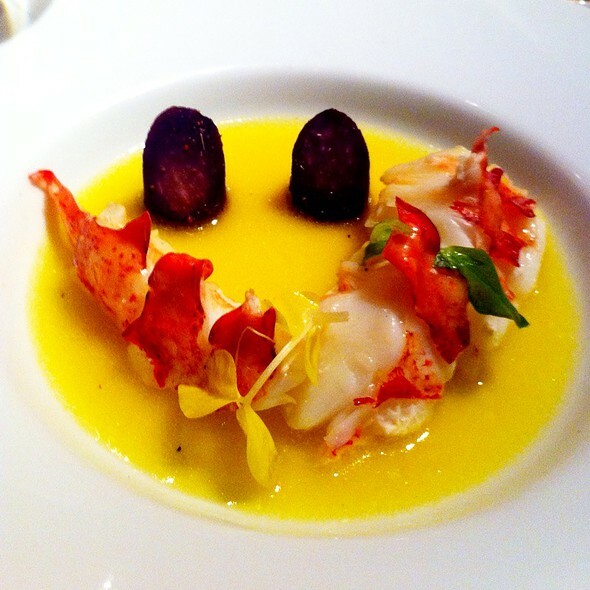 But the most disappointing thing is the food, only the lobster was good, others were just average. Not sure if it's because it's shutting down soon, that affected its quality. Doesn't worth the price. The benchmark for restaurants globally. Simply superb! Quite simply one of the best dining experiences you will find anywhere. Having dined in probably 100 1 star places and 20 2 star places this was my big 3 star salute. A 3 star is a rare beast and expectations run high - this was my pilgrimage to a temple of haute. In places like this you expect to be welcomed like old friends and treated like royalty - no such thing here (have we gone to France by mistake). Our table wasn't ready so we were shown to a small table in the bar - no indication of how long it would take and no offer of aperitif - when do they ever not try to upsell you a glass of bubbles - not here. We were eventually taken to the table in what is rather an oppressive room - very Trump glitzy. 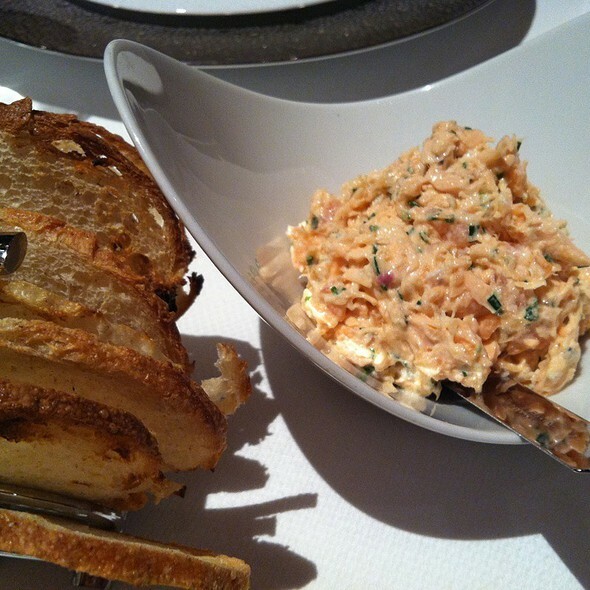 The delicious free pre-starter of salmon rillettes was served even before the sommelier arrived - this is very wrong. The first bottle of wine I selected was sold out - sommelier recommended a delicious alternative that was actually cheaper than my first selection - bravo! My starter Barely Cooked Scallop; Roasted Bone Marrow, Baby Turnips, Calamansi-Butter Emulsion was one of the most technically accomplished dishes I have ever eaten - a taste of 3 star heaven. Wife's Lacquered Lobster Tail; Tagliatelle, Black Truffle Sauce was equally brilliant ditto her Sautéed Dover Sole; Lemon-Potato Mousseline, Shallot Emulsion ($28 Supplement). My Baked Lobster; Chayote Mousseline, Lobster Fried Rice, Brazilian Moqueca Sauce ($18 Supplement) was pristine and delicious but rather spoiled by the one dimensional Mocueca sauce - tasted like a spoon of paprika dissolved in water. The wine was finished and empty bottle taken away without any question of whether we wanted another. I had to flag down a waiter by waving my hand vigorously over my head to get another couple of glasses. We had more attentive service in Katz. At this point the waiters start to reset the tables for dinner - clank, bang, clank. The desserts were beautifully crafted - but all in all poor service leaves a bitter taste in the mouth not to mention the hole in your wallet. We enjoyed Le Bernardin for lunch. Service was impeccable, attentive but not overbearing. Fish was perfectly prepared. Dessert might have been most difficult selection...one of each, please. simply amazing meal from start to finish! scallops and langoustine dishes were fantastic opening dishes, and monkfish and lobster mains were spectacular. as you would expect, service was on point without being intrusive. somoleir was very helpful in offering great pairing suggestions to further enhance a great meal. What an amazing sea food experience. Our table did the tasting menu which was off the hook. That's good, because at $220 pp it wasn't cheap. Most dishes were accompanied by hand spooned foam or sauce which became a little redundant. But without fail everything was utterly amazingly delicious. Many unique combinations of flavors. Food is superb as everyone say! Head down to Eric. Real food that you can recognised and able to taste as good as they look! One of the best restaurant I had been! This was my first experience at a 3 star Michelin restaurant so of course it blew any other meal I've ever had away. I had the chefs tasting menu and it was indescribable. Everything was perfectly balanced. The service was great and the waiters very attentive. They even asked if I'd like a tour of the kitchen! How wonderful is that?! And I got a chance to meet the head chef! Overall it was a wonderful experience and well worth the price. Next time I'm in New York and if I'm lucky enough to snag another reservation I'll most certainly come back. This is the 5th time my husband and I have been to Le Bernardin. Usually for a special occasion. Each time the experience has been memorable and wonderful. We did the smaller tasting menu this time , with wine pairings. Everything is exquisitely presented by staff who are eager to make you comfortable and to answer your questions. The fish is fresh and delicious, with subtle and dense sauces. And the wine pairings are always perfect and often surprising. This has to be our favorite restaurant. We Did the Chef tasting menu, was amazing presentation and the food was all delishious! Told the confirm call staff it's a birthday celebration and was told it's going to have candle on the side when desert served but nothing happened. Mentioned to one of the staff and the lady responded "oh" and that was it. Food was very plain, every dish was tasted as expected, nothing special or extraordinary. Waiter eye rolled at one of the other waiter who made a mistake. At the end of the meal was rushed by the waiters asking us to leave. Very unpleasant experience, I would not recommend it to any of my friends and family and will not go back. 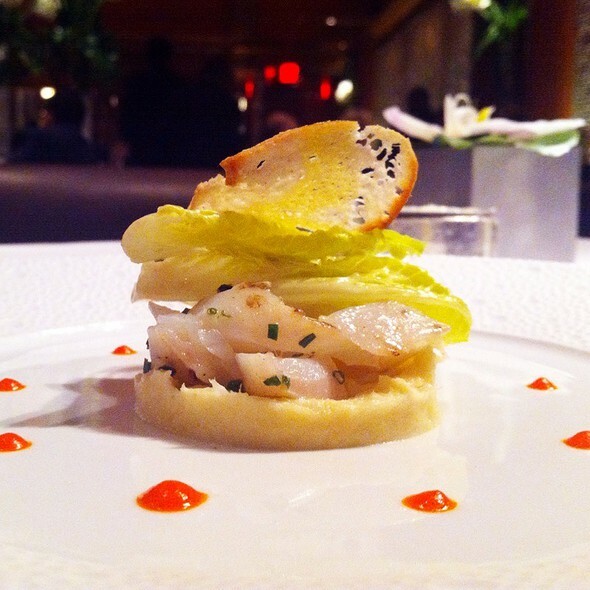 The "fish in excelsis" theme continues at Le Bernardin. We went for lunch and while the food and service were very good, the pace bordered on "rushed". La experiencia fue fantástica. El nivel de la comida fue excelente. La atención por parte del personal fue excelente también. Excellent service, and food was delicious and well presented. The only thing was that my girlfriend had a food allergy of raw tuna, and we mentioned it to them and but she ended up getting sick shortly after the meal. We think there might have been some of the raw tuna in one of the dishes. Either than that, it was a very enjoyable meal. An outstanding dining experience. Beautiful dining room and beautifully presented courses.